Learning about different biomes in science? 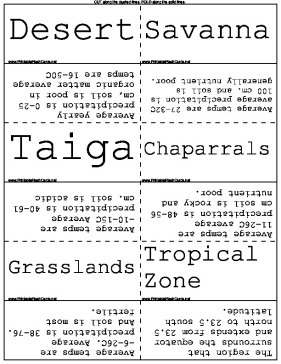 This set of flash cards will help you remember the qualities of several biomes, as well as several other important terms relating to these regions. Savanna Average temps are 27-32C average precipitation is 100 cm. and soil is generally nutrient poor. Chaparrals Average temps are 11-26C average precipitation is 48-56 cm soil is rocky and nutrient poor. Grasslands Average temps are -6-26C. Average precipitation is 38-76. And soil is most fertile. Tropical Zone The region that surrounds the equator and extends from 23.5 north to 23.5 south latitude. Tundra average temperature is -27-5C average precipitation is 0-25 cm and soil is frozen. Weather Condition of the atmosphere at a certain time. Elevation The height of an object above sea level. Rainforest Average temperature 25-28C average precipitation yearly is 200cm or more, and soil is thin and nutrient poor. Climate The average weather condition in an area over a long period of time. Polar Zone The north or south pole and its surrounding area.